It’s been a slow year for me riding wise. Between another below normal Colorado snowpack and a partially torn MCL ligament, I’ve been on the sidelines for a good chunk of the winter. And between being out of shape and overloaded at work I even considered skipping Alaska this year but fortunately for me the plane tickets were not refundable so staying at home was not an option. After a long painful odyssey involving extended quality time in the Seattle airport, we finally made it to the promised land. There the dominant color had been grey for several days so there was a lot of pent up demand among the troops when the skies finally cleared. The first day was spent exploring the close in terrain and sussing out the snowpack but there was still plenty of fun to be had. On morning two we headed straight for an old favorite, “Hangover Helper” (pictured above). We were supposed to save it for the Nike film crew but we decided to help them out by checking for stability – turns out there was nothing to worry about. Hangover is a classic AK run – a 4500’+ vertical run with that starts with a huge steep face, narrows through a gully and then has a playful and totally delicious spine at the bottom – and since we were the first ones through, we got to enjoy it in all its pristine glory. I could have left then and felt like I’d gotten my money’s worth but that was only the beginning. We were now in that sweet spot, where blue skies, deep snow and stable conditions combine to make the mountains your playground. The snowpack was a little thin this year so not a lot of technical spine skiing but the big open faces were more than open for business. By Day Three, we were in the groove and knew we had to move fast because of incoming weather. We went back to Hangover for another helping and then moved on to “Deflower” which was still quite the virgin. With the clouds closing fast we headed for a hill we had often admired but never skied – Flower Mountain. Two untracked runs from the top allowed us to finish on a high note. We didn’t want it to end but felt blessed to get what we got. As much fun as the mountains are, the people who get you there are just as special. As always the folks at Alaska Heliskiing were unbelievably helpful and welcoming (thank you Sunny, Gabe, Vicki and company). The picture above is from a King Crab Bake held at the owner Sean Dog’s house on Saturday night. And yes, that’s the legendary “Stifler” holding his latest conquest. I also need to acknowledge my partners in powder without whom the down days would have been much duller (they also took most of the photos in this post). The old saying “no friends on a powder day” doesn’t hold true when a helicopter and thousands of acres are involved. As a matter of fact, friends who you see primarily in a helicopter, tend to have very positive memories associated with them. Not that I need any encouragement to go heliskiing, but after the horrible season we had in Colorado this year I definitely needed a snow fix by the time April rolled around. And what better place to get some spring skiing in than Haines, Alaska where April is prime time as the temps get milder and the days longer. The season in Haines doesn’t start till mid February and I had been following the reports since. While Alaska had record snows early, by the time we arrived it hadn’t snowed in two weeks so we weren’t sure what to expect. We soon found there was nothing to worry about as is usually the case when you have tens of thousands of acres in your permit area. We spent most of the first day on a run called Canadian Buns, so named because it butts up against the Canadian border. It’s actually part of an area known as Buns of Steel because that’s what you need to negotiate the 4000 vertical feet from the top. On this day we called it pure heaven as it was covered with lovely soft powder and totally untracked (at least when we started – almost all the tracks above were made by our group). As you can see from the pic above, the snow was very user friendly so even though the helicopter could have taken us anywhere we wanted to go, we stayed put and would still be there if we hadn’t run out of daylight. Every day it got a little warmer but it didn’t matter as while the runs happily transitioned from sweet powder to perfect ripping corn they all retained the same basic characteristics – steep sustained pitches with lots of untracked lines, and really, what else do you need? Fortunately I had a great crew to enjoy this all with led by David Cole, the man who (thankfully) convinced me that I really needed to check out Alaska last year and who I now wouldn’t consider visiting Haines without. He brought another steep freak fiend named Aaron who brought another friend named Justin and were joined by two Taos vets, Keith and the Flying Frenchman, Eric. See the happy family below. As usual we stayed at the luxurious Plywood Palace which this year had been stripped of every non essential item and even some essential ones like silverware and lightbulbs – but hey, it’s a step up from a lot of the other lodging like the employee housing below. But of course no one visits Haines for the indoor accommodations – it’s the stuff outside that makes any of the comfort sacrifices seem trivial. People come from all over the world and sit for weeks just to get a couple of days and once you’ve been there when it’s good, it’s not hard to understand why. And of course I need to give a big shout out to the folks at Alaska Heliskiing. As always they took care of everything we needed as I personally went through several rolls of duct tape in a somewhat futile effort to keep all my gear functioning. No one is there for the money or the fame, just the opportunity to do some of the best skiing in the world and help others enjoy it at the same time. One thing there was no shortage of on my Haines heli trip was helmet cams. Every one seemed to be sporting one in every shape, size and manufacturer. Because of safety issues, there was no setting up for shots so unless you had a super long telephoto or optical zoom a helmet cam was your best bet. The problem with helmet cams of course, is that without anyone else in the picture they quickly get boring no matter how good the skiing was. So I have a good 30 minutes of endless face shots and untracked terrain which will mean very little to anyone except me in my old age. I did pull still frames out of any good footage I had of others or scenics from my still camera which can be found here. As for the rest of my footage I’ve decided to just post this one little excerpt from a run called T-Top. It wasn’t the steepest or the deepest and it went on for a good 5 minutes longer than this clip, but it’ll give you a good idea of what the riding was like including my favorite new snow terminology – “sluff management”. For years I’ve been hearing epic tales of heliskiing in Alaska and seen numerous film segments of mind boggling terrain. I always assumed that terrain would be off limits to me as while I’ve spent a lot of time on a snowboard I’m certainly no alpha dog. But thanks to the prodding of an old heliskiing associate, I decided to give it a shot and boy am I glad I did. The Alaskan heli scene is quite different from your typical heli operation. Out go the luxury lodges, 5 course meals and highly structured schedules. Here everything is about the skiing and everyone is on board with that. We’re staying in what is known as the “plywood palace” where the big challenge is trying to get hot water in the shower. However, the views are spectacular, the company good and as they say in real estate it’s “location, location, location”. And it’s not just the accommodations in Alaska that are different – what really stands out is the terrain. This is true big mountain, technical skiing the likes of which I’ve never experienced anywhere else. Had they shown me pictures first of where we were going to ski I probably would have passed but once they dropped us off I discovered that not only was it rideable, it was a tremendous amount of fun. If you look closely at the picture above, you will notice a skier circled in red – our guide who is posted up in a place where he can keep an eye on us while we’re doing the run. The guides here are just like the clients in that they are huge powder hounds albeit with a lot more experience and thus would take us to places they wanted to ski – in other words to what is more commonly known as “the goods”. Where's Waldo - can you spot the two skiers in this photo? The two pictures above best demonstrates how we worked with our guide. First he would point out potential routes from the helicopter on the way up. Then he would scout the slope, set up in a spot where he could keep an eye on us, and then send us down one at a time giving us instructions via radio when we needed them. I had never skied terrain like this but was very pleased to discover I could. The gods really blessed our group on this trip as we managed to hit the best conditions of the year so far with deep light snow, great stability, and most importantly good visibility. The forecast before we came called for rain/snow every day and the week before they were down almost all week but fortunately for us the forecasts were wrong and we’ve flown all week till today. But when they are down it usual means it’s dumping up top and that was the bounty we found when we got out there. When our guide warned us to watch out for our “face shots” on a particularly steep run we knew we were in for a good time. The two shots above are of a run called “Indy 5000” – the 5000 being a reference to the 5000 vertical feet that the run covers. It is the kind of run you can only find in Alaska and one I never imagined myself riding. But with a couple of feet of fresh snow it was a blast and a learning experience at the same time. I’ve had to totally reorient my skiing up here – back in Colorado you look for the gullys where all the good snow is – in Alaska you have to stay up on the spines and out of the gullys where all the slough runs into. It’s a whole different way of approaching a mountain but is tons of fun once you get on the program. There were mellower runs too but what they all had in common was a thick layer of fresh light snow. This provided plenty of opportunities for enjoying the natural features of the terrain as Dave demonstrates above. By day 4 we are all fine with the weather turning funky as our legs were all ready for some rest. What is also hard to imagine even with the help of cameras is how spectacularly beautiful and impressive the Chilkat Range is. Ragged peaks, huge spires and glaciers everywhere you looked. It would have been worth the trip just to see these mountains no less to get to ski down them. 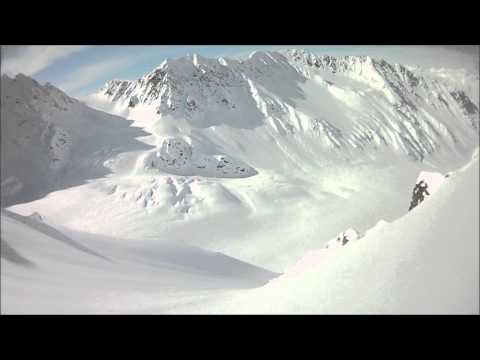 Of course none of this would be possible without the tremendous folks at Alaska Heliskiing. From the office folk to the guides to Jack who gives us rides everywhere – everyone is super nice and more importantly on top of their game. I had anticipated maybe some attitude since this is one the premier heli spots in the world but no attitude here just a bunch of folks chasing the best skiing in the world.